Generac's Protector Series offers benefits that competitors can’t match: installation flexibility and cost reduction. Sophisticated, yet intuitive controls. Quiet operation. Supported by a 24/7/365 customer support team at our corporate headquarters, and a nationwide dealer network of more than 6,000 strong. A cutting-edge, intuitive control. The Evolution controller features a multilingual, two-line LCD text display with color-coded, backlit buttons. It has received upgrades, including USB flash capability, smart battery charging, voltage adjustment, and backlit membrane pad-style buttons. 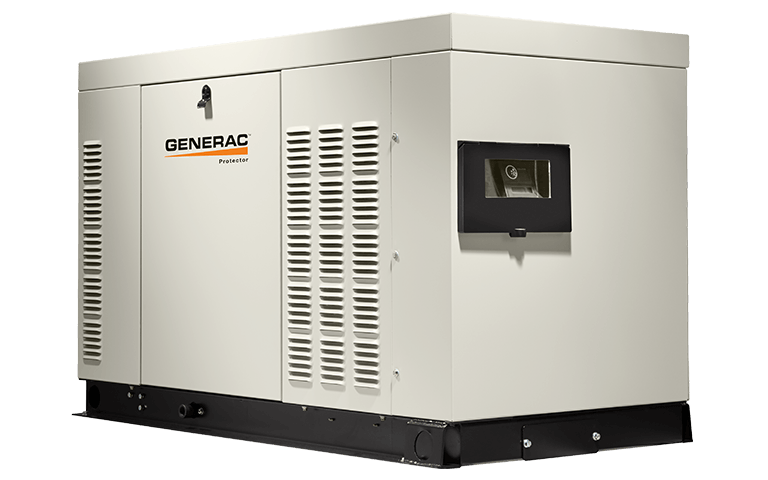 Rated 5 out of 5 by Homerun1 from Great reliability and features - The Perfect Solution This Generac Generator is really terrific. So happy we invested in it and the relialibity it brings to the party. Great Product !! We use Boyland Electric for maintence and they are terrific - World Class ! Rated 4 out of 5 by Papee from Likely excellent; however, to early to really rate. Installation, hookup & commissioning was all easy as was the Generac support with the technician performing the start-up. I’ll be able to provide a more accurate review after we witness the programed weekly maintenance runs and actual power failure performance. Rated 1 out of 5 by junkcollector from junk Had this generator a total of 5 days before it broke down. Ran the initial 2 hours for the test fine. When it came time for its cycle, it faulted with a cam pulse error. The wiring harness needs to be replaced now. Just our luck a ice and snow storm is headed our way tonight. Thanks for building junk that wont protect me and my family when needed. Rated 5 out of 5 by Highlander from Super Excited Couldn’t be happier with this generator and the wonderful team that sold it to me and installed it. Nicely done! Rated 5 out of 5 by Offthegrid212 from working flwlessly My Generac has already proved itself valuable and reliable to me. I am in a very rural area and my power is a little flaky at times. It has already come on at least 5 times that I am aware of and it has been a much appreciated convenience. The longest outage was about 7 hours and there was no issues during that time. Rated 5 out of 5 by Ed from 25 KW This was a replacement for a much older Generac; great improvements, great design and easy setup by service/dealer! 25kW-RG025 is rated 4.5 out of 5 by 12.